Other changes include decreased salt losses in sweat and urine as well as an improved blood pressure response.All of these changes improves an athletes’ ability to handle heat stress during exercise. It is also important to note that factors affecting these changes determine the extent to which adaptations occur. For example, acclimation in hot and dry environments has been shown to be different from that in hot and humid environments (a greater sweat rate increase has been seen in the latter case). Acclimation is also known to depend on volume of exercise, intensity, and maintenance of an elevated body temperature during exercise. When preparing to acclimatize to the heat, athletes should gain a base level of fitness in a cooler environment prior to heat exposure. Fit individuals already have some of the physical advantages that are gained with acclimation—for example, an increased sweat rate. 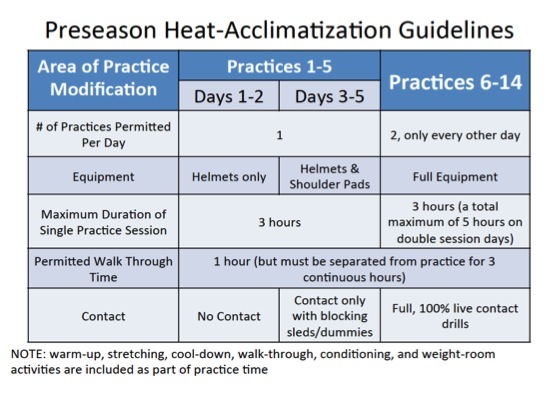 Guidelines have been introduced for the high school population for the purpose of gradual heat acclimatization during the preseason. Make sure to monitor for signs of EHS, heat exhaustion and heat syncope during the initial days of acclimatization. Having an athletic trainer available on-site before, during and after practice can help monitor athletes for exertional heat illnesses. When practicing or having an event in a hot and humid environment, assessment of risk can be made using a Wet Bulb Globe Temperature (WBGT) monitor. Casa DJ, Csillan D. Preseason Heat-Acclimatization Guidelines for Secondary School Athletics. J Athl Train. 2009;44(3):332-333. Recently, state high school athletic associations have started to acknowledge the importance of heat acclimatization, and have adopted the 2009 guidelines released by the National Athletic Trainers’ Association for secondary schools. These were modeled after the 2003 guidelines that the NCAA implemented. With the assistance of Korey Stringer Institute, many states have adopted these guidelines into their state athletic association handbooks. A timeline of adaptation of heat acclimatization guidelines can be seen on our high school state policies page. Regrettably, athletes are still suffering and dying from exertional heat stroke. This can be changed and many lives can be saved by speaking up and supporting mandatory state guidelines for heat acclimatization. Armstrong L, Maresh C. The induction and decay of heat acclimatisation in trained athletes. Sports Med.1991;12(5):302–312. Casa D, Csillan D. Preseason heat-acclimatization guidelines for secondary school athletics. J Athl Train. 2009;44(3):332–333. Pandolf K. Effects of physical training and cardiorespiratory physical fitness on exercise-heat tolerance: recent observations. Med Sci Sports Exerc. 1979;11:60–65. Pandolf K. Time course of heat acclimation and its decay. Int J Sports Med. 1998;19:S157–S160. Pawelczyk J. Neural control of skin and muscle blood flow during exercise and thermal stress. In: Gisolfi CV, Lamb DR, Nadel ER, eds. Exercise, Heat and Thermoregulation. Traverse City, MI: Cooper Publishing Group; 2001. Poh PYS, Armstrong LE, Casa DJ, et al. Orthostatic hypotension after 10 days of exercise-heat acclimation and 28 hours of sleep loss. Aviat Space Environ Med. 2012;83:403–11.